Stopped by Starbucks this afternoon for my evening Venti Iced Americano With 8 Shots, and was surprised to see the KRTV truck there. 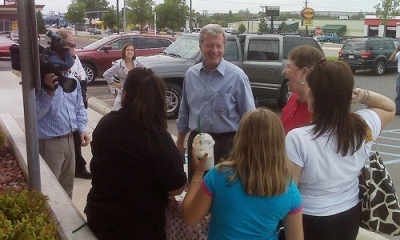 Quick glance told me why: Senator Max Baucus had stopped in for a coffee and to chat with folks. I knew that Matt was interviewing Baucus today (here’s the full story and interview), but didn’t know that there was also going to be a “meet and greet” with locals. Snapped a couple of phone pix, shook Baucus’ hand, watched him talk with customers. Pretty cool. Although I disagree with Baucus on most things political, he seemed like an amiable and sincere guy – you can tell he’s from Montana.